Recently, Randi Weingarten, president of the American Federation of Teachers, surprised many a disillusioned public school teacher with her new mantra: “Vam is a Sham”. This is a major shift from her previous agreement and collaboration with Race to the Top policy enforcers. She admits that she has always been leery of value-added “but we rolled up our sleeves, acted in good faith and tried to make it work.” Now, she’s disillusioned. Welcome to the world we have been living in since this all started. We now wait for a public statement by UFT leaders. Whatever the reason, educators, parents and students welcome this realization and acknowledgement that the use of faulty metrics to measure the value of students, teachers and schools has dangerous consequences. One of the very reasons why the grassroots union caucus, Movement of Rank and File Educators, formed last year is due to the acknowledgement by educators in the ranks who already read the warning signs. With this welcomed change of heart and, now, staunch campaign against the use of value added measures, we are aware that this could affect contract negotiations in local districts, and the union also plans to lobby the Education Department. We are also rightfully cautious, yet hopeful, that we will not be faced with the patterns of our past. With an entire generation of new teachers, many of whom were not a part of the previous contract negotiations, will we be facing concessions to our working conditions? Will we be told to continue waiting for the curriculum or improved standardized state tests that align undemocratically set Common Core Standards? 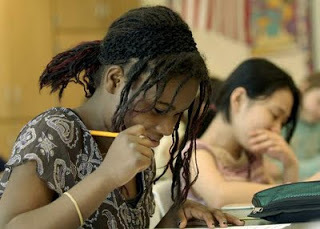 We are certain that the grassroots efforts of groups such as MORE, as well as with the movement of parents in New York City who have risen against the over reliance on test scores, have contributed to Randi’s public change of heart. We will be here to provide our experiences and support in efforts to ensure that our teaching conditions positively impact our students’ learning conditions. MORE has generated alliances with parents and students who have felt the consequences of a leadership that had, for far too long, ignored the truth about high stakes testing and the faulty metrics of value added measures. “Testing has narrowed the curriculum our students are being offered. Quality teaching and education is developmentally appropriate and responsive to diverse student needs and abilities. A systemic obsession with quantitative data has increased teachers’ paperwork and stripped them of their professional discretion”. Here’s a brief glimpse of AFT leadership attitudes and alliances past and present. Our national teacher union leaders taking funds to collaborate with problematic policies that have no reliable evidence for raising student achievement and improving teacher effectiveness, back in 2009, is what started the most vocal of educators, researchers, policy analysts and even psychometricians grumbling. By August 27, 2010, the Economic Policy Institute published an open letter, Problems with Using Student Test Scores to Evaluate Teachers. “The Gates Foundation’s MET project (much but not all of which the AFT agrees with) has found that combining a range of measures—not placing inordinate weight on standardized test scores—yields the greatest reliability and predictive power of a teacher’s gains with other students. And the AFT and its affiliates are exploring ways to accurately determine what measures best serve as a proxy for our work.” Still showing outward public collaboration with the Gates Foundation, funder of ill-conceived high stakes testing and teacher evaluation policies, continued to prompt parents to opt their children out of standardized tests and by this time, the punitive practices imbued by these policies have sent invaluable educators leaving the profession or fighting for MORE. Then, on January 10, 2014, Randi posted in the Huffington Post “Teaching and Learning Over Testing” alone and not associated with the Gates Foundation. She states that the AFT has long known that VAM is unreliable and that they have always questioned the use of test scores to evaluate teachers. The UFT’s own high stakes testing task force in 2007 came to the same conclusion. This is contrary to the earlier co sponsored written articles, but what matters is the shift that has happened. While MORE stands in solidarity with our union president’s newly discovered position, we can not forget that she has helped negotiate contracts which include the flawed use of test scores to determine a “teacher’s effectiveness” in districts around the country. This was against the wishes of her own rank and file and the advice of educational experts. She can not undo the damage that has already been done by her support of test based measures. In addition, Randi continues to relentlessly advocate for Common Core, while the standards are unproven, not field tested, were not created by with the input of public school teachers and parents, and have caused even more reliance on high stakes testing. At the November UFT Delegate Assembly, a MORE delegate made the argument that the current teacher evaluation system “Advance” is unviable, and UFT President Michael Mulgrew scowled. 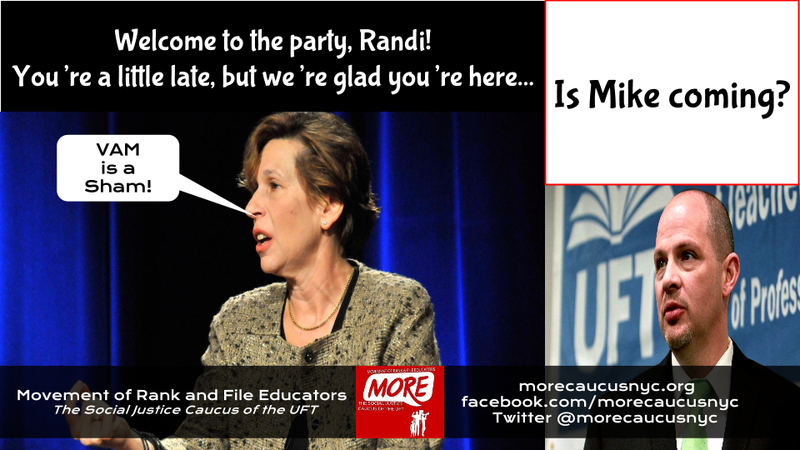 If Randi can have a change of heart… say it with us, Michael Mulgrew, “VAM IS A SHAM”.